Welcome to our Captain Jack Casino review! Please don’t forget to contribute to the page by sharing your honest experience with other OnlineCasinoBluebook.com readers. Captain Jack Online Casino is a very unique casino, while most casinos adopt a Las Vegas or a Monte Carlo theme and take pride in their bright colors and flashy lights, Captain Jack Casino does not take the same approach. The casino takes players on a great journey to the world of the pirates as they accompany Captain Jack and search for his long-lost treasure. Players will then claim their own share of the riches by placing bets on the casino games and claiming great rewards. 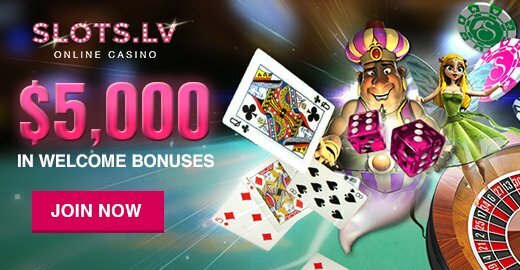 The casino offers players a great selection of casino games that cover nearly every gaming type that players from around the world would be looking for. This includes the most classic card game in the world, blackjack, as players will find many variants of the game. Other gaming genres include slot machines, roulette tables, keno, bingo games, scratch cards and video poker among other games, all powered by RTG (Real Time Gaming). As the casino promises, players will have a chance to grab their share of Captain Jack’s treasure and the first chance that they will get in order to do that is the welcome package that it offers. This casino has a pretty generous welcome package that can award players up to $11,000. 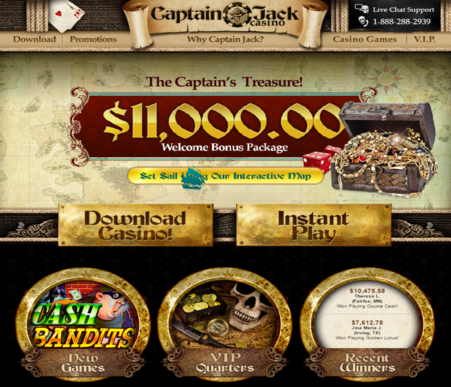 While most casinos reward players for their first, second or even third deposits, Captain Jack Casino, through its welcome package, rewards players for making their first 10 deposits. The first, second, third and fourth deposits are matched at 100%; the casino will match up to $1000. The minimum deposit is $30 and the maximum deposit is $1000. As for the 5th deposit, players will get 50% of the previous 4 deposits, in order to claim that bonus; players will have to get in touch with support. The 6th, 7th, 8th and 9th deposits will be matched 100% with a maximum of $1000 with the same minimum and maximum deposit of the previous bonuses. Players will then earn 100% of all of the previous deposits without having to make a 10th deposit; players will also have to get in touch with customer support to claim this bonus. The software of the casino is powered by RTG, which is a well-known and a respected name in the industry of online gambling. It provides the casino with two casino versions. The first one is the downloadable casino that players have to download onto their computers, as for the second version, it is an instant play flash based version that can be enjoyed directly from the internet browser without any needed downloads. The software is very simple and user-friendly as everything is laid in a clear way so players can easily find the page or the casino game they are looking for. This makes the software quite easy even for novice online players who have never played at an online casino before in their life. Players from around the world will always find the support that they need around the clock through the 24-hour available customer support service of the Casino. These means that whenever players face any issues or have any questions concerning the games, the deposits, the bonuses or any other issue, they will easily get them resolved and answered by contacting support. They will be able to get in touch with support through 4 different contact means. These include phone (888-288-2939), fax (866-725-1102), email (help@captainjackcasino.com) and live chat. Players who are looking forward to placing deposits in order to enjoy the casino games will find a great set of depositing options that they can pick from. The list of options includes Neteller, Pre Paid Card, Visa and Master Card, Person2Person, Bank Wire and American Express among others. Players who want to request a withdrawal will be able to use the same methods that are used for making deposits. All withdrawals are handled promptly and smoothly. The casino is a transparent, an honest and a truly secure online gaming site that maintains a long-term and a close relationship with its players. The casino is certified by TST (Technical Systems Testing), which is a well-respected testing facility that offers a great range of consulting and testing services to iGaming sites. All of the games and the applications of the casinos have the TST Certification Seal that provides the users with the assurance that they need and guarantees them that all of the casino games are random in their outcome and fair in their operation. The casino is also known for its gambling responsibility as it does not allow any players under the age of 21. The casino is licensed according to the regulations and laws that are set forth by the government of Costa Rica. Captain Jack Casino is a top notch casino that offers its services to millions of players from all around the world. It has succeeded in building a great reputation for itself because of its variety of games, its gambling responsibility and its ability to provide players with a great gaming experience. Thank you for reading our Captain Jack Casino review!